I will be pleased… if some of the young people here decide to make a career in international politics and diplomacy, because we need you in this interdependent world. Kofi Annan (1938-2018) was a Ghanaian diplomat who became the seventh Secretary-General of the United Nations. 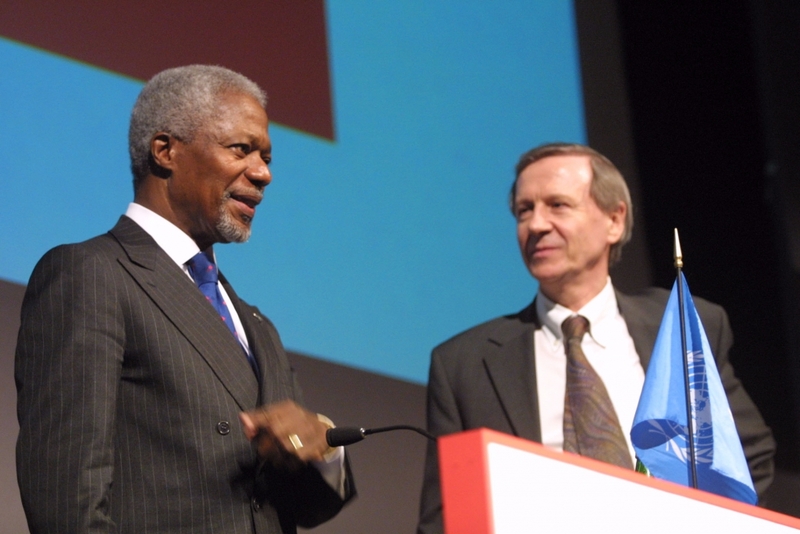 He served two terms between 1997-2006 and in 2001, he and the United Nations were jointly awarded the Nobel Prize for Peace. His second talk at LSE, “Interventions: a Life in War and Peace” (the title of his memoir) was filmed on 4 October 2012 in the Peacock Theatre. The event’s chair was writer and broadcaster William Shawcross. 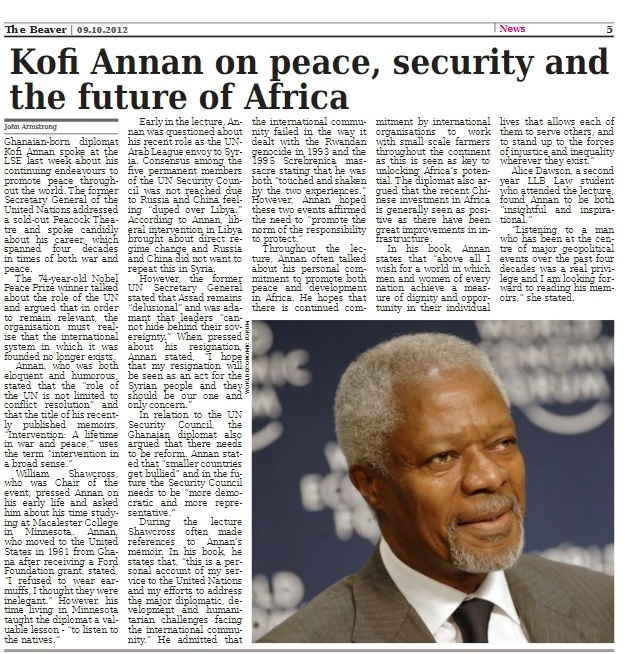 On 9 October 2012, LSE student newspaper The Beaver featured this write-up of Kofi Annan’s talk by John Armstrong, entitled “Kofi Annan on peace, security and the future of Africa”. 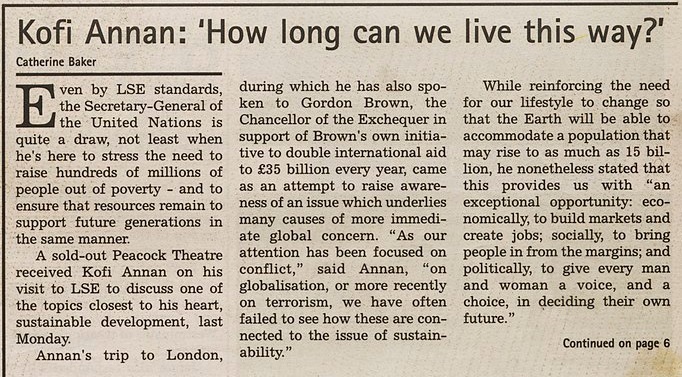 Kofi Annan had previously visited the Peacock Theatre at LSE on 25 February 2002, delivering a public lecture entitled “From Doha to Johannesburg by way of Monterrey: how development can be achieved and sustained in the 21st century”, chaired by Anthony Giddens. 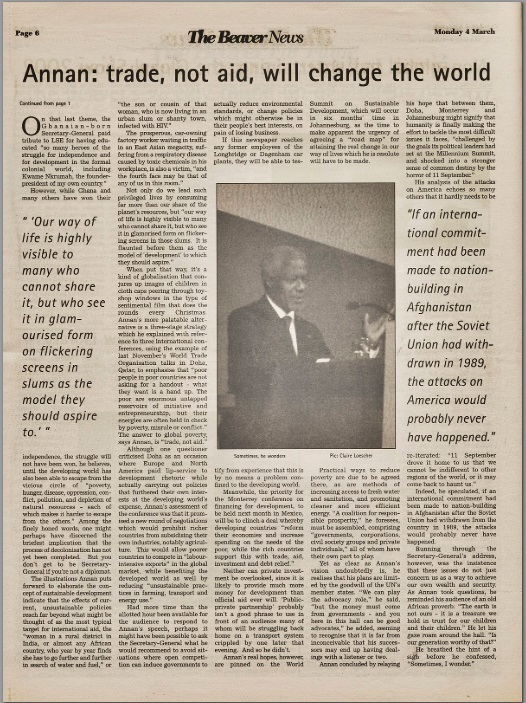 Watch the lecture at LSE’s Digital Library and see what The Beaver reported in the following week’s issue.